Good morning! I hope everyone had a fun, safe Halloween. Can you believe it's already November? I feel like I say this at the beginning of each month. It's so cliche, but goodness, time just flies by! Do you feel that way, too? This week, I'm loving this bedroom by California design firm, Bonesteel Trout Hall. I came across the image above on Pinterest. It didn't say who the designer was and was linked back to a broken page, so after running the photo through Google Images, I found everything I needed to know about the room from an old blog post by Katiedid. 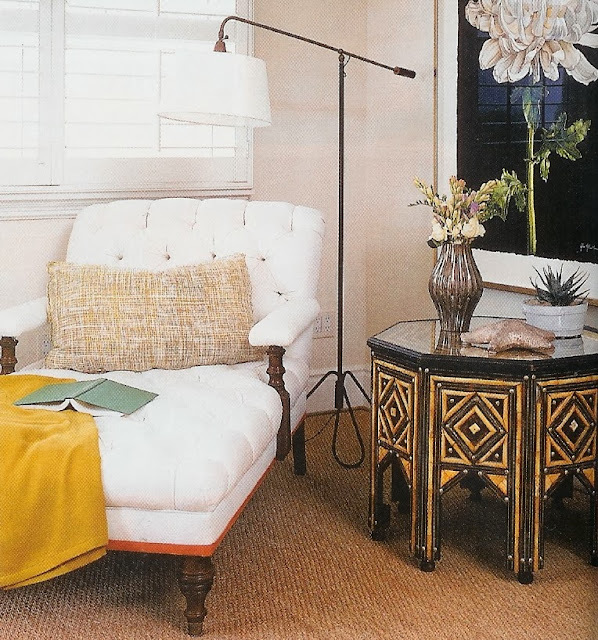 Apparently, the room was featured in Western Interiors & Design magazine at the beginning of 2008. Unfortunately, the magazine fell victim to the publishing crisis and appears to have been replaced by the fabulous, Luxe Magazine. I love knowing that because nearly six years later, the room still looks so fresh (aside from the staged shoes and handbag-- a styling trick that does feel quite dated). 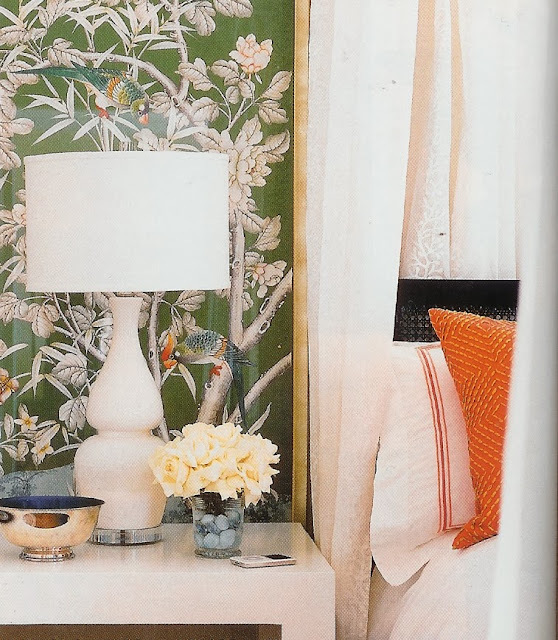 I love the framed wallpapered panels flanking the bed. I've become obsessed with bed hangings since the first time my friend, Mark Sikes was sweet enough to invite me to stay at his home while I was in Los Angeles. It's like sleeping in a cloud and makes you feel a bit like a princess. I also love that the linens are crisp white with touches of coral which work so beautifully with the turquoise and blue tones in the chinoiserie panels. The zebra stools add a graphic touch, while the seagrass rug adds texture and lends a casual vibe to the room. So, was this where the orange-craze began? Actually, I am beginning to think that orange (or turquoise) will be the dated evidence in a year or so. However, the enduring quality of the natural fiber rug, the double gourd lamps, the four poster bed, and of course the gorgeous wallpaper are eternal. Thanks for taking the time to run down the details on this room. I agree that this is very well done. I'm wondering how the drapery panels are attached to the bed. Do you think the tabs have snaps?